Doing the DJ thing full-time, DJ Ant 1 keeps his hands full with his Ri$ky Bizness Crew, Krazy Kids Radio, and various DJ gigs. He cut out some time to chat with SF Station and let us into his hip-hop world. 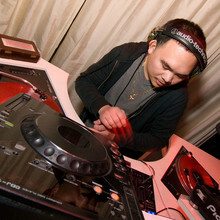 DJ Ant 1 (A1): I started DJing in 1996, and got into to it because I had an older cousin who was a DJ. He was in a crew called "Supernatural Turntable Artists" that was pretty big in the battle scene and I really wanted to do what they were doing. Plus, I'm from Daly City and the DJ game was huge at that time there. Shortly after, I did the mobile DJ thing and did weddings, dances, etc. After that, I started doing DJ battles with my crew, at the time, called "Fundamental Skratch Funk." $ir Tipp was in that crew, who's been a best friend to me since grade school, along with DJ Teeko and Max Kane of 41funk, and F.A.M.E. SFS: How did you connect with the Ri$ky Bizness Crew? What’s instigated the name? A1: Eddie Ra$kel pretty much started the Ri$ky Bizness Crew and I think he had an idea that $ir Tipp, Massan, Ruby Red I, and me would make an ill DJ crew since we all had similar passions, origins, and tastes in DJing. Then $ir Tipp started making beats and Ruby Red I was already making beats, so we wanted to start making music. Another producer, Cee-Rock, hopped in the crew and then we started recording tracks and music with fellow SF rappers J-Billion and PFUNKTHEKING. My take on the story of our crew name is maybe we were all into gambling or maybe we were all bold at certain things we did or maybe we all liked the Tom Cruise movie, thus, being risky. I think that is how the name came to be. SFS: Tell us about Krazy Kids Radio. A1: Krazy Kids Radio is a podcast done by the Wild N Krazy Kids crew, which consist of graphic designers, promoters, thinkers, and DJs. We broadcast and record our show out of Youth Radio in Oakland. We started the show in the summer of 2007 and decided to do hourlong DJ mix shows that have a different theme every week. We have probably done over a hundred different themes bumping hip-hop, R&B, soul, house, rock, and whatever genre we think sounds good with the theme. The show has mostly Ruby Red I and me DJing, along with the occasional guest. We have J Boo, Miso Soup, and Mz. Fran hosting on the mic. I'm just happy that we have a great audience that really supports us and we love them. Right now we have over 9,000 subscribers worldwide. Shout out to y’all! SFS: What are some of your favorite collaborations between artists? A1: Tough question. There are too many to say. Here's a few: J Dilla and Madlib, Nas and Wu-tang, Drake and Lil Wayne, Jake One and Freeway, Method Man and Redman, Joe Montana and Jerry Rice. SFS: What spots do you like to hit up for your gigs? A1: Right now, my favorite spots to play at in SF would be small spots like 222 Hyde and Showdown. I like playing at smaller spots that have good sound and a good spot where all the homies can chill and vibe. Don't get it twisted though, I do love and strive to play for large audiences at large venues. SFS: Do you have any new mixtapes coming out? A1: I'm trying to start a new DJ mixtape for this year real soon, I still have to figure out what that's going to be. Right now, I'm working on PFUNKTHEKING's mixtape. It’s so funny how you have to specify a DJ mixtape versus a rapper mixtape these days. SFS: Who are some artists who you think deserve more credit in 2010? A1: J-Billion, PFUNKTHEKING, this dude C Plus from Sacramento, DJ Drewbyrd, 1-O.A.K. from the Honor Roll crew, Chip tha Ripper from Cleveland, [email protected]!ns from NY, Thunderheist, J-Stalin from the bay, Mayer Hawthorne, AZ, Jay Electronica, Reflection Eternal, and Gucci Man. SFS: What's in store for you? A1: I've been producing more lately, but I’m still a rookie compared to my peers. I plan to work on more music with the crew, make more mixtapes, get more out-of-town gigs, and hopefully make a Ri$ky Bizness crew 12-inch vinyl sometime soon.